Successfully Added Colorful Solar Powered LED Light String - 4.5 Meter, 30 LED, 4 Colors, Waterdrop Design, 8 Light Modes, 40000 Hour Service life to your Shopping Cart. These colorful LED lights bring hours worth of light and joy into your life during the upcoming winter months. 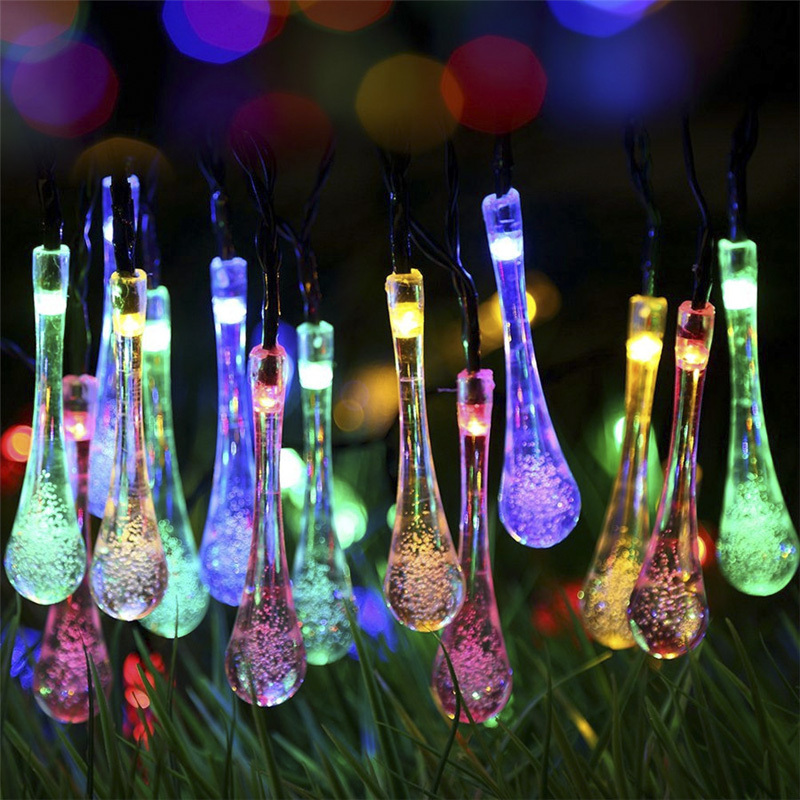 Featuring a stylish water drop design this LED light string is perfect to be used for decorating your garden or outside terrace. With its 8 different lighting modes, you can be assured that these LED decoration lights are sure to set the right mood and atmosphere no matter the occasion. Whether you like to like to decorate your garden for Christmas, or simply like to enjoy an evening drink with your friends or family in the backyard while being accompanied by these colorful lights – with this LED light string you can’t go wrong. Holding a total of 30 colorful LED water drip styled lights, this 4.5 meter LED light string lets you decorate a significant area of your garden, terrace, bar, or house. Coming with different color LEDs, this light string brings some true color into your life as it holds 7 Yellow, 7 Blue, 8 Red, and 8 Green LED lights. Its 8 lighting modes let you switch in between different brightness’s and flashing modes, ensuring that you will always have the right type of light that fits the current atmosphere. Powered by its own solar panel you can be assured that you will never run out of juice. Even during the dark winter months this decoration light string will provide you with light throughout the night as it holds a sufficient 600mAh battery that, when fully charged, delivers several hours worth of power for you to enjoy these magnificent color lights. With a life span up to 40,000 hours you can be assured that this LED light string will get you through countless days and nights – providing you with colorful lights and stunning light effects that are sure to set the right mood for any occasion. This LED light string comes with a 12 months warranty, brought to you by the leader in electronic devices as well as wholesale electronic gadgets..